This charcoal hooded sweatshirt features the Bullet logo in red with a white outline on a heavyweight pocketed hooded sweatshirt. Cotton blend. Classic raglan 2 tone color block Bullet logo pullover sweatshirt with hood and handwarmer pocket in front. This stylish hoodie is gray and red with an outlined logo 50/50 Cotton/Polyester Fleece. Available in Small to 3XL. This heavy weight hooded sweatshirt features the Bullet and Mercury logos on the chest and sleeves. These are available in black with red logo and white outline. This classic 100% Polyester 3 tone color block Bullet logo pullover sweatshirt with hood and handwarmer pocket in front is fleece lined. It is Black with Red sleeve inserts and white piping. Limited quatities available. 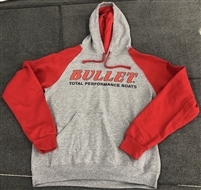 This High Performance Bullet Logo Hooded Pullover is made of a modern day fleece lined stretch polyester to make it water resistant and durable. Gray with Lime Green inserts and logo or Black with Red inserts. 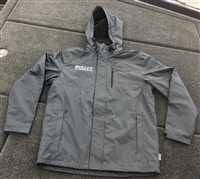 The shell is constructed on windproof/water resistant medium weight 100% Toughlan nylon, with a 9oz heavyweight cotton polyester/rayon gray jersey lining. Features two exterior pockets with zippers and one inner right chest pocket with zipper. Raglan sleeves and hood. Elastic waistband and cuffs. Bullet logo on front and back. This Jacket is available in a very limited quantity and won't be available again until next winter. Made of Water shedding stretch material with multiple pockets and zippers and an inner fleece lining. Bullet logo on front chest. The shell is constructed on windproof/water resistant medium weight 100% Toughlan nylon, and is fully lined with supre heavyweight 11.5 oz anit-pilling panda fleece. Features two exterior pockets with zippers and one inner right chest pocket with zipper. Raglan sleeves and generous fit. Stretch waistband and cuffs. Bullet logo on front and back. This jacket is fleece lined and features the Bullet logo on the front and the back. Jacket is wind and water resistant, but not classified as a rain coat. This jacket has a removable hood and the cuffs are adjustable. Comes in Grey with Silver logo and Black outline. Designed and tested by professional anglers, the ACCEL100 leads speed-rated floatation into a whole new level of quality and comfort. 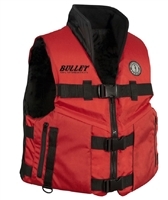 Designed specfically for fishing, it blends functional safety with luxurious comfort. Features the BULLET Logo on the front and back.